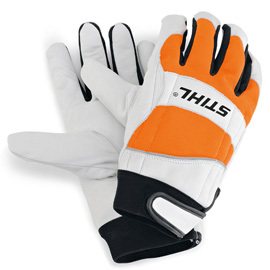 Made from cow hide leather, STIHL DYNAMIC work gloves have an ergonomic curved design for better grip, higher comfort and reduced fatigue. An elastic cuff supports the wrist and prevents dirt or chips from entering the glove. Cut protection level Class 1. Ideally suited to top-handle saw users, tree care professionals, forestry workers and landscapers or demanding land and homeowners.